The architecture of the United States Virgin Islands, formerly the Danish West Indies (1671-1917), is mostly defined by the styles found in the three towns of Christiansted, Frederiksted, Charlotte Amalie and the associated rural estates. The majority of current buildings in the historic towns date to the 17-19th centuries. Neo-classical aesthetic influences from the European Renaissance, including stately and well-crafted Palladian, Spanish Baroque, Rococo and Victorian traditions, are found throughout the islands. As early as the 17th-18th centuries, Scandanavian, Dutch, German and Czecholslovakian building methods coexisted or were fused with the architectural traditions of English, French and Spanish settlers. The Copenhagen style that emerged in the mid to late 19th century is known for its yellow brick finishing and restrained ornamentation. The enduring buildings also embody the symbolism of "triumph in the face of adversity" and serve as a living testament to the African artisans and laborers, primarily of the Akan, Ibo and Bantu heritages, who constructed the buildings. An early apprenticeship program established by Moravian missionaries primarily of German and Czechoslovakian origins and the Danish colonial government advanced training in the areas of masonry construction, wood joinery and wood framing. Consequently, such detailing was performed locally due to the sophisticated craftsmanship available during the 18-19th centuries. 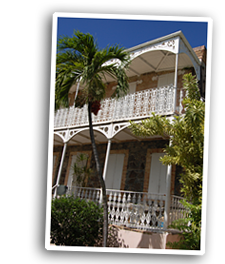 Virgin Islands Architectural HistoryRich and well-crafted detailing are the qualities that make the architecture of the Danish West Indies/U.S. Virgin Islands specific to place. Traditional building practices include: distinct sawn gingerbread fretwork; thick rubble masonry walls; mortise and tenonwall and roof framing, wooden jalousies, verandas and jalousie shutters on hinged frames; and the proliferation of Danish styled arches as found along the extensively arcaded sidewalks and alleys of the historic districts. The masonry fireproofed buildings mandated by early 19th century fire codes assured the endurance of an intact historic urban infrastructure in the contemporary towns. 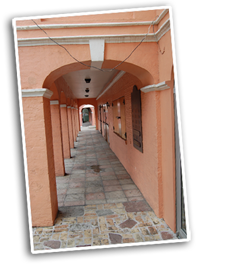 Contemporary architectural design in the U.S. Virgin Islands often incorporates traditional forms from this early period, including: (1) blocked, free standing structures; (2) internal and external spaces defined by large central rooms, gallery areas and gateways leading to courtyards and plazas; (3) a simple, stately facade organization where yellow-ochre or crème yellow and white are the colors of preference; (4) pronounced welcoming staircases; and (5) roof forms in the hipped or clipped cable traditions with ornate framing elements.